This post is not suitable for faint-hearted individuals and those who will grossed out after looking at these photos. Putting my disclaimer statement above. Not everyone can stomach, by just looking at those tiny, scrawny, witch looking feet. This delicious delicacy chicken feet aka pheonix claws, could be found on one of those trolleys in a dim sum restaurant. ... but if you are one of those who enjoy having Sunday morning breakfast at your own slow, leisure pace in one of those dim sums (or dim sims) restaurants, then you know what I am talking about! These little morsels (like Chai Kwe, golden fried wontons and many more) could be found in one of the food carts (trolleys) being pushed around the restaurant by the waiters/waitresses, or in fancy hotels... you just place your order. Eating chicken feet is not a new experience to me. I had been having chicken feet as long as I can remember! At home, we usually had lots and lots of seafood (fish) but once a week, mom would treat us to chicken and beef. Mom would buy the whole chicken (sometimes with feathers), she'd clean chicken and cut into parts. She'd separate the cuts : bony parts for curry and meaty part for deep frying...yums. ...and kids being kids... my siblings and I, would 'fight' to reserve our favourite parts. 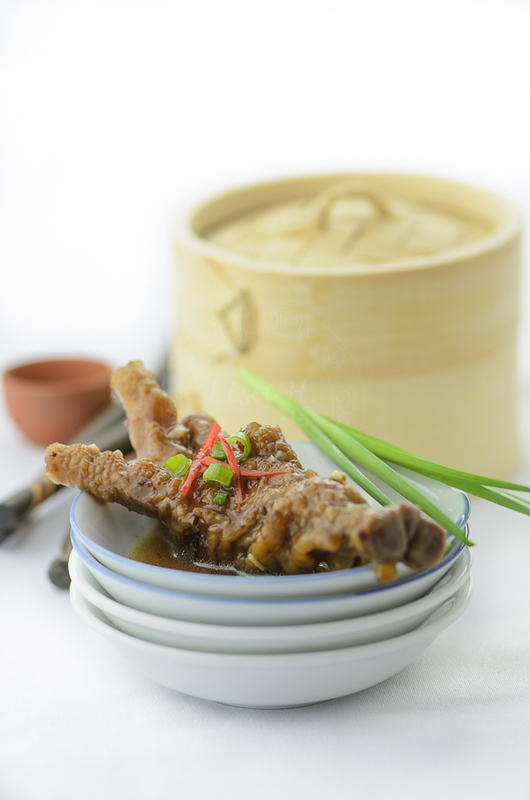 A friend once told me, eating chicken feet is good for your knee (I had knee arthroscopy recently), it helps with arthritis! Lo and behold... she is so right!!! Wash, clean and clipped 'toenails' with scissors. Pat with kitchen paper and leave to dry for at least a couple of hours (the drier it is, the less splatter when deep frying). Toss in sugar and mix thoroughly. Heat oil to 150C and carefully add chicken feet, a few at a time. Fry for 3-5 minutes till brown. Fill up a large pot with water, and immediately toss chicken feet from frying pan to bowl. Repeat the process until all chicken feet are done. Leave the chicken feet to rest until they are wrinkly and bloated again. Drain off some water until the water level is just about covering the chicken feet. Add ginger and star anise. Bring to a quick boil and then simmer for 1 1/2 hours. Meanwhile mix all the ingredients under marinade into a pot, simmer for 1/2 hour then set aside. 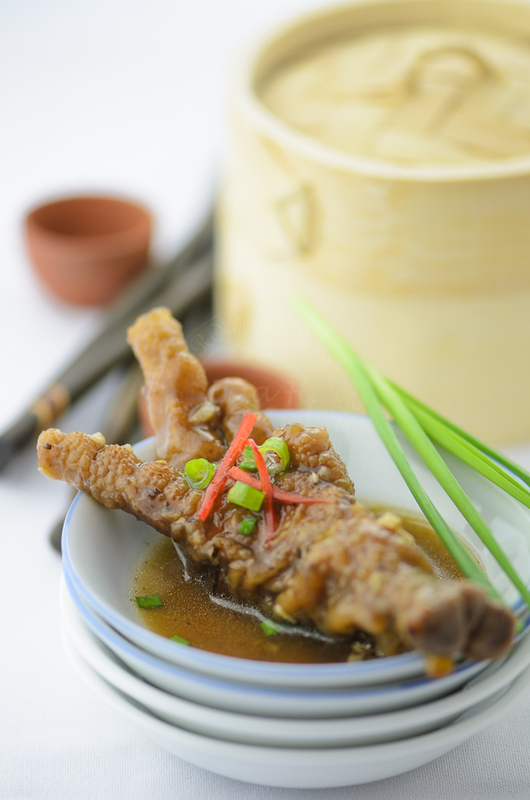 Once the chicken feet is tender (nearly fall off the bone), drain off the water. Leave it to cool in the strainer (as well as to drain off as much water as possible). Marinade chicken feet and refrigerate overnight. 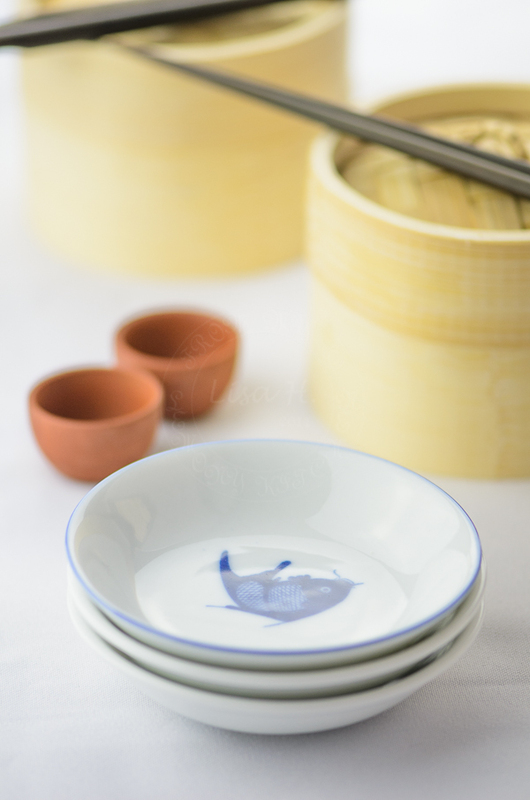 To serve: Place 4-5 chicken feet on a small dish and place it on a bamboo steamer and steam for 15 minutes. I love dim sum - one of my absolute favourite brunches. My love does not stretch to chicken feet. But maybe it should. I might start with the restaurant version first before attempting to cook. Isn't it funny how we get about certain parts of the animal that we think shouldn't be eaten. My Mum comes from the North of England and we grew up eating black pudding (blood sausage) which most of my friends are horrified by - though I have seen it popping up in restaurants recently as it become trendy.